Anyone who’s ever spent time in Australia’s remote northern reaches can tell you about the wealth of musical talent of Australia’s first peoples. It seems every community has a resident band of some description, and music and dance are everywhere – whether it’s desert reggae or ancestral songlines. Every now and then an artist or group transcends remoteness to enter the popular imagination and find much-deserved international fame – acts like Yothu Yindi and Warumpi Band rightly establish themselves as part of the canon, bringing with them crucial messages about indigeneity that popular culture has too often pushed to the margins. 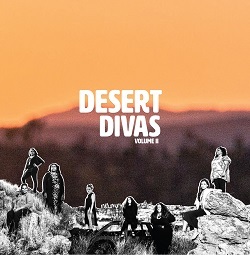 Desert Divas Volume II is another important chapter in this story. It’s the result of a project run by MusicNT, the Territory’s representative body for musicians, and an outstanding snapshot of the emerging talent to be found across the region. Indigenous songwriters from across the Territory were paired with mentors from the Australian music industry (Leah Flanagan and Nai Palm among them), and invited to record at Alice Springs’ legendary CAAMA studios with uber-producer Anna Laverty. The result is eight original songs that span plaintive folk, heartfelt country and polished, radio-ready pop from eight artists on the rise, and build on the 10 tracks of the first instalment in the series, released in 2012. This long-running project of professional mentoring, talent development and true reciprocity of skills and ideas between centre and periphery continues to bear fruit – expect to hear more from each of the artists here. As much inspired by Spencer P Jones and HITS as The Shangri-las and the Norton Records catalogue, The Pink Tiles have covered a deceptively large amount of territory in a few short years. From the twee pop of their first cassingle to the dreamy garage bangers of their debut LP and even a Christmas song, they are a band studied in rock 'n' roll lore but never beholden to its cliches or limitations. They embody the "gang against the world" lifestyle of great bands without the tiresome egocentricity that clutters pub stages as much as halls of fame. #1 Fan is broad in scope, both musically and thematically. Catchy pop hooks and sharp vocal harmonies abound but they're welded to scorching highway rock 'n' roll. 'Sammy' sounds like it's been ripped from the cassette player of Mad Max's 1973 XB GT Interceptor. There's an unlikely parallel here with early Dinosaur Jr's obsession with burying pop melodicism under walls of fuzz. Naturally, The Pink Tiles deliver it the other way round - the earworms front and centre with noise and gravel crunch trailing in their wake. Jim Diamond's mix finds a poised balance that allows these forces to work in harmony rather than competition. The Pink Tiles are grounded in an understanding that rock 'n' roll lifers come in all varieties - from sweaty, charismatic front people to gig pig super fans and bookish, fastidious record collectors. This album is a celebration of the love that drives people to dedicate their lives to the weird sub-cultures of independent music. #1 Fan is ultimately a love letter to music communities - from Melbourne to Memphis - and all the characters who make them possible. At a time in which the cult of individualism has reached sickening proportions, The Pink Tiles remind us why we actually fell in love with rock 'n' roll in the first place.